Last Thursday despite the cold I wandered over to the local brew haunt The Sampler in pursuit of a special treat: the launch of Sixpoint’s formidable new triple IPA, the Hi-Res. What I got was a quadruple hit with not one, but four innovative Sixpoint brews on tap. They proved to me again why Sixpoint is such a quality Brooklyn institution; they are not afraid to try new and sometimes crazy things in the name of great beer! In fact this is known as the "Sixpoint mentality" to insiders like Jamie Leithead, the sales rep on hand at Thursday's event. 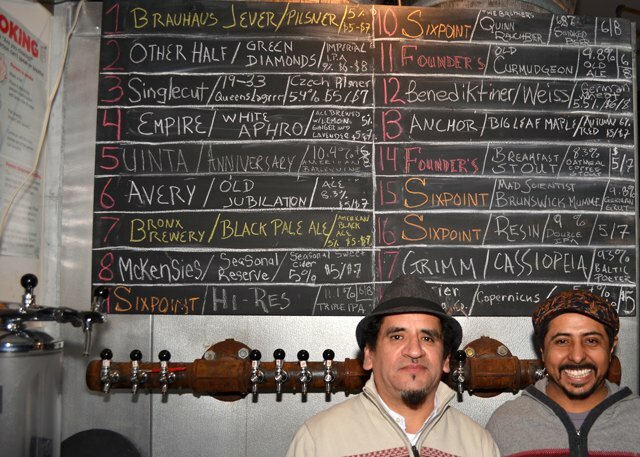 The masterminds behind The Sampler: owner, Enrique Arias (left), and front-of-house, Rafael Martinez. The Hi-Res is an amped up version of Sixpoint’s classic double IPA, the Resin. In case you haven't put two and two together, the name's a play on the fact that cannabis and hops are in the same the family, Cannabinaceae, which in science means they're related and perhaps even share a common ancestor. It's surprising sweet and drinkable for a triple IPA consider that it has an 11% ABV (that’s the alcohol content people and it’s so high it's close to some wines). In the glass it's a rather bright light orange with a faint white head. The hop aroma doesn’t hit you in the face but is more subtle with hints of pine and fruit. The beer is quite syrupy (largely from the distillation of the oils found in the hop flower, sound familiar? ), with a lot of sweetness from the fruity hop flavors like tangerine and mango, and a slight taste of caramel from the malt. The fruity lingers on the finish, the beer going down smooth, which considering the high alcohol content means that this beer could quite easily lay you out! 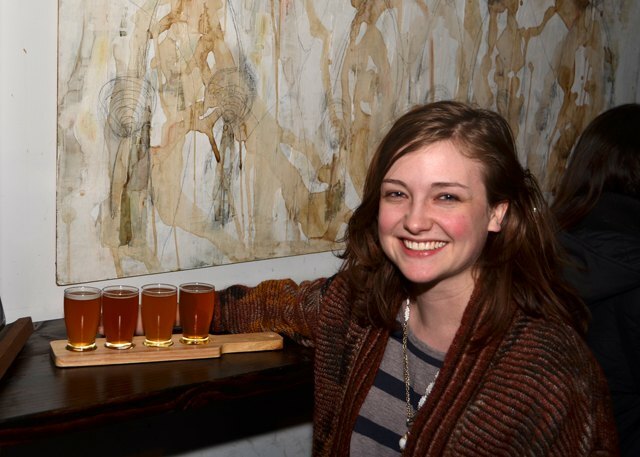 Erin Wicks enjoying her Sixpoint brews. Though the Hi-Res was our our primary target, my photographer Matt Chapman and I decided to share a pint to be sure we gave all the Sixpoint brews their due diligence. Next up was The Brothers Quinn Rauchbier - a German style beer traditionally made by drying malted barley over open flames creating a "smoked beer" - brewed through a collaboration with a couple lucky homebrewers. The Brothers Quinn takes it's smoky history quite seriously. I can't describe it better than Jamie did when she said she tells people "it's like drinking bacon, but not disgusting." And truly, the smokiness dominated the aroma and taste to the point it was hard to taste the subtler dimensions of the beer. Matt found this to be a bit off-putting, but I'm a fan of anything that smells like a backyard smoker and leaves my mouth with the essence of smoked salmon, especially during the extended vortex. The reverse was true of the Brunswick Mumme (pronounced moom-meh), the latest in Sixpoint's Mad Scientist series, experimental, limited-release beers made every two months that allow the brewers to play around outside of the Sixpoint classics. The Mumme style is an ancient Germanic brew brewed with a myriad of strange ingredients like the inner rinds of fur and a dozen uncracked eggs thrown in a cask and aged for years. For their take on the recipe Sixpoint played with their fair share strange ingredients like birch bark and prune juice (which thankfully did not make the cut), settling at last on one using cardamom pods, juniper berries, and the strain of hops called Simcoe, known for its intense spruce flavors. The result? A thick and syrupy brew that coats the inside of your throat like a menthol cough drop. It is piney and spicy and minty all at once with a bitterness unique to juniper, like having an entire pine forest in your mouth. For me the experience was a bit heady and intense, highly enjoyable during the novelty of the first few sips, but that was all I needed. A study in opposites however, contrary to the Rauchbier, Matt gulped it down merrily as I moved on to the Resin. 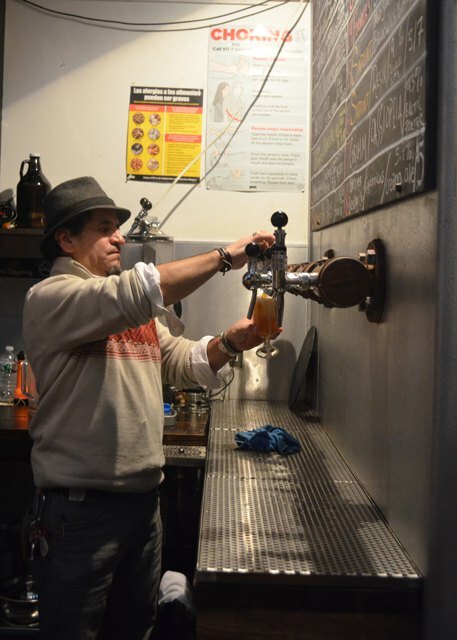 Enrique Arias, owner of The Sampler, pouring a brew. The Resin is a wonderful old standby, if not the highlight of Thursday's celebrations. Just 'cause it wasn't the star of the show doesn't mean we don't appreciate how special it is! It's a quality double IPA, impressive for maintaining a beautiful balance despite its intensity and alcohol content - it rounds out at %9 ABV. That's a big beer folks and they use it as an opportunity to play with the delicious flavors a hop can impart on a beer - at once citrusy, piney, and a bit grassy, with the taste matching the intense aroma and a lovely bitter aftertaste on the tongue. All you can want in a proper IPA! It's syrupy and resin-y as the name promises, though not as much as it's Hi-Res big brother, and some nice caramel malts keep the hops from overwhelming your tastebuds. Erin Wicks with Jamie Leithead (Galic for toilet, I kid you not), badass sales rep for Sixpoint. The Hi-Res was part of a greater mission by The Sampler to give folks in the hood access to interesting beers and people who make them possible (follow them on Twitter and Facebook to get the latest on all their upcoming events). Thursday's event was particularly fun because of the unique Sixpoint beers they featured. I wouldn't necessarily have wanted a pint of every single one I tried, and Matt would have ordered quite different pints than I, but that's the thing about experimental brews - they aren't all going to appeal to everyone. Herein lies the danger and the reason so many breweries stick to a few standbys they know will continuously appease the masses. The problem is that without experimenting and taking the risk that a new beer might fall flat with some folks, you elimination the possibility of creating something truly special and that's why I have such mad respect for Sixpoint and their wacky brews. Keep 'em coming! 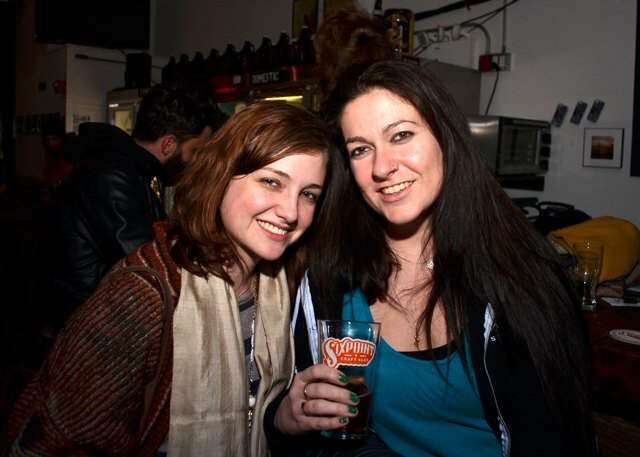 The Sixpoint Hi-Res Launch Party gets 4/5 stars - 3 for their intriguing, creative and downright crazy brews that showcase a brewery ethos that demands respect, and 1 to The Sampler for providing the neighborhood with a great place to try great beer! The Sampler is located at 234 Starr St and is open Monday-Thursday 12-11; Friday-Saturday 12-12; Sunday 12-9. 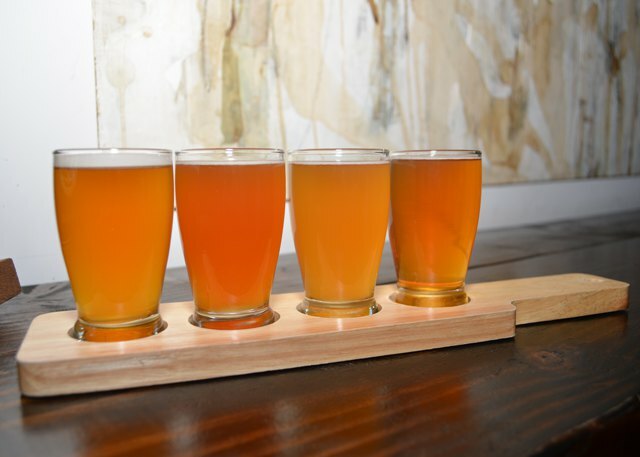 A tasting of four beers is $8.